Like something out of colonial times, although Thailand was never colonized, Vimanmek reminds me of an over-sized governor’s mansion, sitting resplendent in a tropical oasis. However, Vimanmek was not designed for any governor. Instead, it was originally built on the not-very-well known island of Ko Sichang, as a retreat for King Chulalongkorn (aka King Rama V). 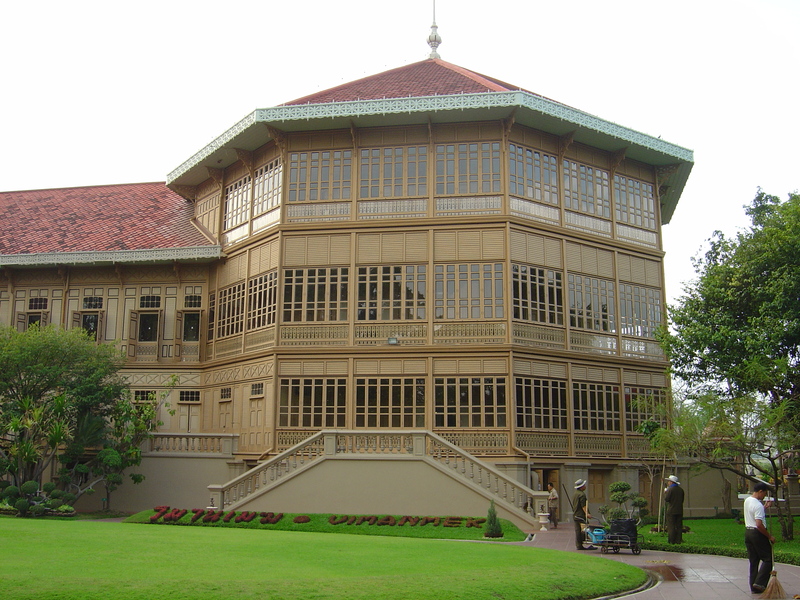 It was subsequently dismantled and rebuilt in the Dusit Royal Gardens in Bangkok in 1901. As I suggested in the opening sentence, the design is very European, and it highlights the influence that King Chulalongkorn’s visit to Europe had. In fact, there are quite a few structures that were built during King Chulalongkorn’s reign that bear strong European design aspects, which I will cover in other blogs. After the building was completed, King Chulalongkorn only lived in it for 5 years before moving on to other palaces. From 1906, it was only used occasionally and by 1932 it became a royal storage building. 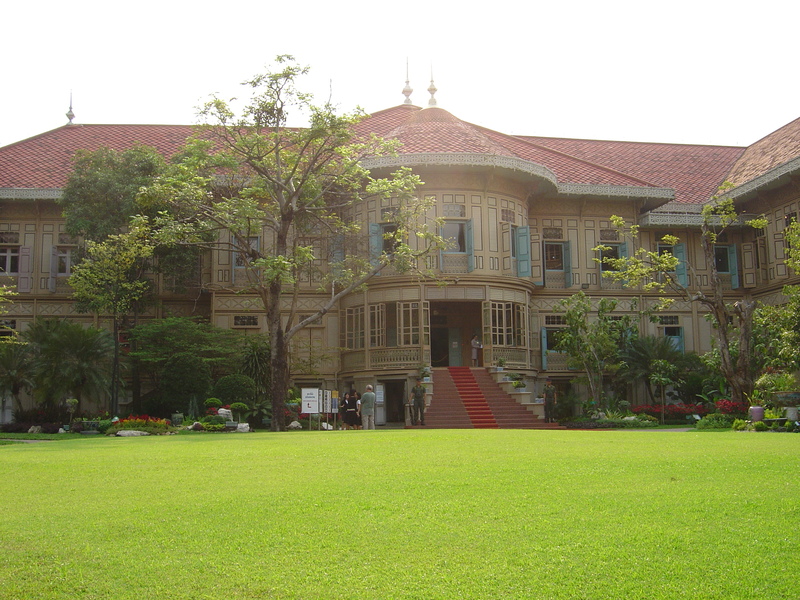 However, in 1982, Her Majesty Queen Sirikit had the palace refurbished into a museum and today it has become the showcase for many interesting collections and valuables of the Chakri dynasty including many of the items that King Chulalongkorn had collected from his European visits. In addition to the unique architecture, Vimanmek is special because it has been built entirely of golden teak (which is both rare and extremely impervious to insects and the elements). The wood in this building is worth a significant fortune. The palace is also a deceptively large building, consisting of 72 rooms even though most of the structure is only 2 storeys high. I put off visiting Vimanmek for many years because it just didn’t sound that interesting compared to many of Bangkok’s other sites, and ultimately I only visited because I was in the area and had nothing better to do. However, once I entered the beautiful Dusit Garden complex, I realised what a mistake I had made in putting my visit off for so many years. The photos really do not do justice to this gorgeous building. The exterior is really fascinating when you get up close. In addition, the museum itself has a lot of very interesting items, both Thai, Chinese and European. The guided tours are included in the ticket price and are professionally done. Tropical gardens on the grounds surrounding Vimanmek. 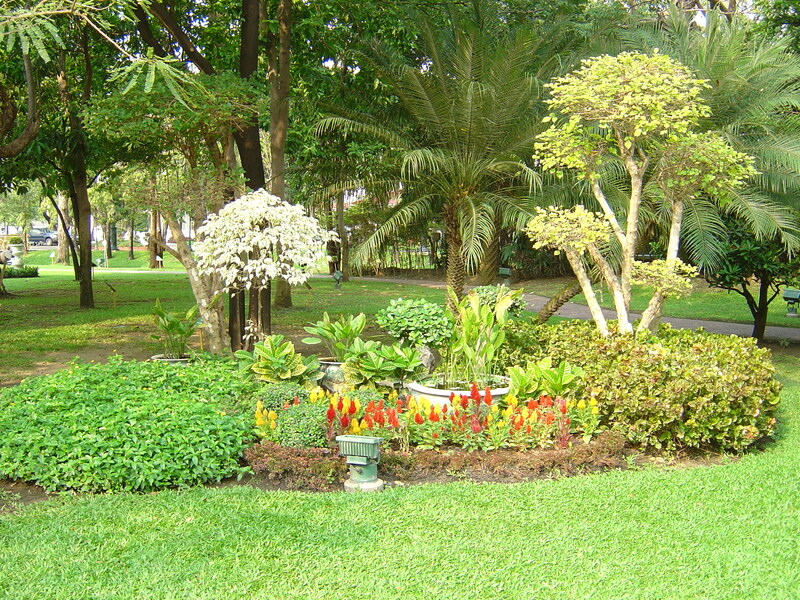 This area was originally the Dusit Gardens, used by the Royal Family, before it opened to the public. 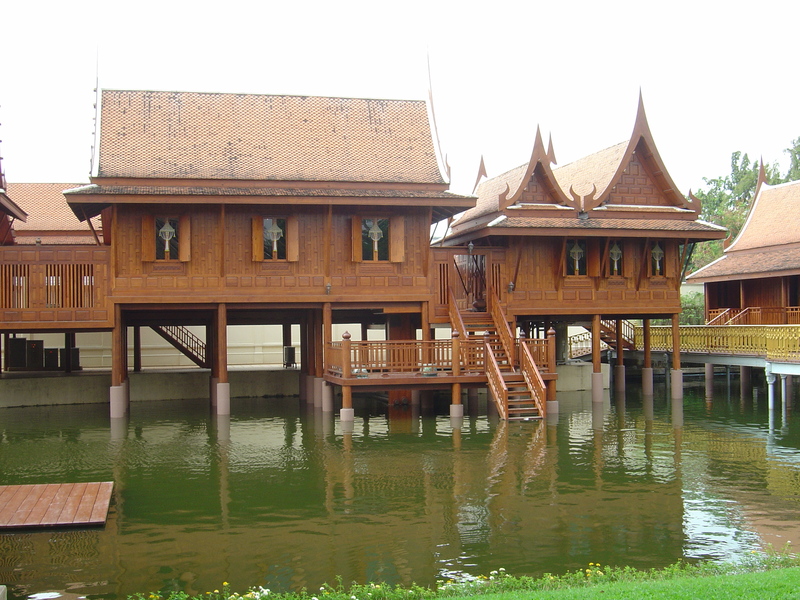 In addition to the teak palace, the Dusit Garden complex includes other historic buildings and there is a pavilion built beside a large pond where you can observe traditional Thai dancing (once again, all part of the initial admission fee). Vimanmek is located in the Dusit district of Bangkok. Unfortunately, from a public transport perspective, this is not an easy tourist attraction to get to as it isn’t that close to any river ferry stops nor is there a subway or skytrain nearby. Taxi would therefore be your best option (just ask for Vimanmek), and a taxi ride to this location should cost approximately 120 baht from the Sukhumvit/Asoke area. If you really wanted to save money, you could take a public bus, in which case, get yourself a bus map, and the best place to catch a bus from is Victory Monument (which you can get to via the sky train). However, a big warning here… the traffic between Victory Monument and Vimanmek is some of the worst in Bangkok. Rush hour in particular is horrendous. An alternative route if you want to minimise your time in traffic would actually be to take a ferry up-river (from Sathorn, Grand Palace etc) and get off at Tha Thewet (Thewet boat pier). There is a nice flower market here worth exploring, and then just grab either a tuk or taxi for the short ride (2km) to Vimanmek). The palace itself is located between the Dusit Zoo and the Suan Dusit University campus, and it has entrances on both Ratchawithi Road (which runs east all the way to Victory Monument) and also on Uthong Nai Road (the grand boulevard that runs in front of the Ananda Samakom throne hall). Then entrance fee is 100 baht, although if you saved your ticket stub/voucher from your 500 baht visit to the Grand Palace, you can use the stub/voucher to get in for free. 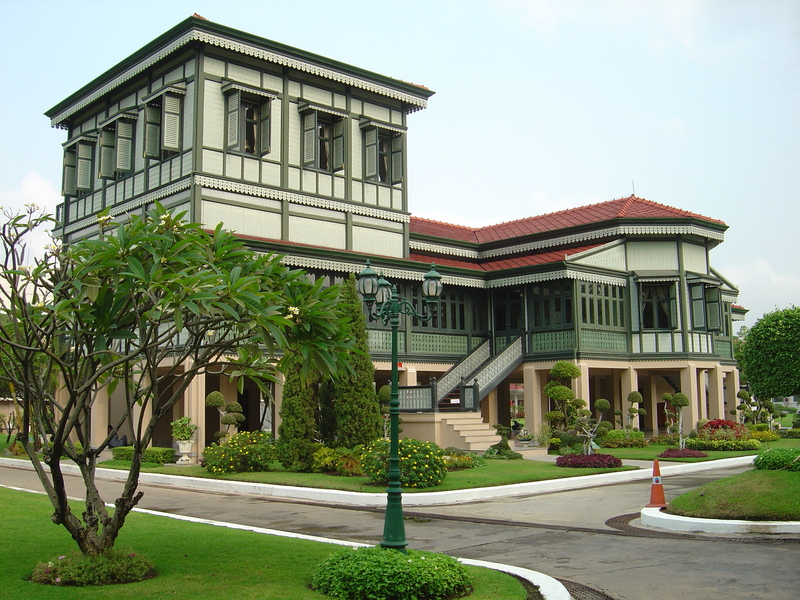 As with most of Thailand’s attractions, Vimanmek palace is open 7 days a week, and is only closed if there is a special public holiday or if the Royal Family wishes to use it for a special event. As with the Grand Palace, note that there is a dress code. Full length pants should be worn, rather than shorts or 3/4 cut. Also, women should not dress too revealingly. If you do forget, you can borrow (for a security deposit) some clothing to cover up. Although this is not one of the bigger attractions around Bangkok, it is still very much worth the visit, especially for those on a longer Thailand holiday, or who have been a few times already, and looking for something a little bit different. One important point though… try to avoid weekends and peak tourist season (especially late December, early January). Visiting Vimanmek when it is overloaded with guided tours is actually a very unpleasant experience. It’s also worth noting that Vimanmek is situated within walking distance of other useful tourist attractions including the Dusit Zoo (a great place to unwind, go on the paddle boats and observe nature in an incarcerated state) and the Ananda Samakom throne hall (a great representation of eastern and western architecture; and the road up to it is great for postcard type photos).